Clockwise from top: Brian Grossman leads brewers on tour of Sierra Nevada Brewing in North Carolina, Kim Jordan addresses bloggers, the outdoor tasting room of Oscar Blues Brewing in Brevard, Ken Grossman (goateed, on left) addresses bloggers. Some mock blogging as self-centered and self-serving. It’s true that there are those who turn to blogging as a way to marvel at their own words online or try to attain free dinners or gadgets. The same can be said of beer bloggers, of course. We’re just in it for the brewery access, the rare beers, and free glassware. I would argue that I am in it for many things. After three days in July of intense beering and bloggery, I was reminded that two reasons are camaraderie and education. 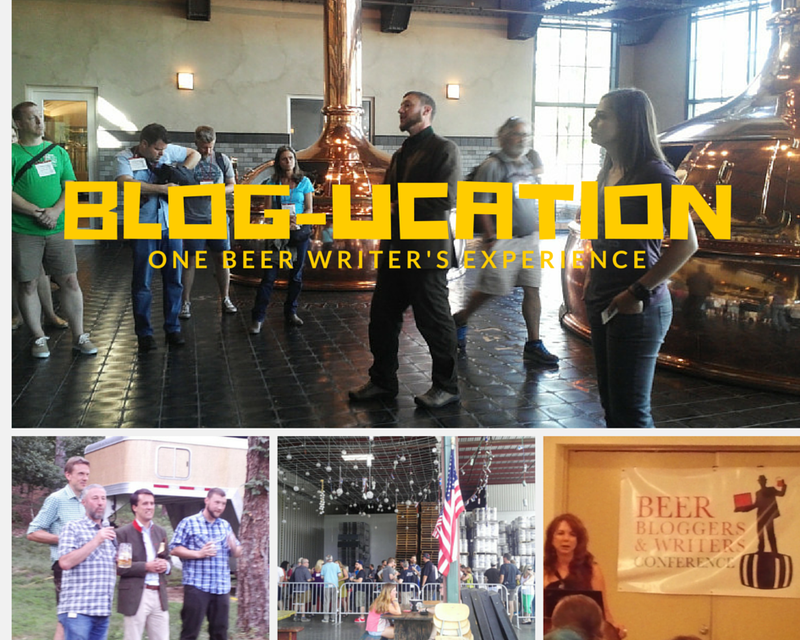 The event was the sixth annual Beer Bloggers & Writers Conference (they added “& Writers” this year), which welcomed about 150 “citizen” bloggers and writers, along with others who represent brewing entities. We took part in seminars at an Asheville, North Carolina, hotel — Four Points by Sheraton. We also drank a whole lot of beer, but for the most part in reflective ways. Speakers included Kim Jordan, president of New Belgium Brewing Company (which is set to open a brewery in Asheville next year); a representative of Budweiser (Huh? I’ll explain…); and a variety of bloggers with tips on professionalism and improving style. Road trips included tours of the expansive Sierra Nevada Brewery in nearby Fletcher, and the hulking Oscar Blues Brewery in Brevard. First, the camaraderie. Writing can be such a solitary act, even for beer bloggers. When I write, and I mean outline and plan and draft and edit, it’s alone. My research is almost always done among others, but even going to bars on assignment or interviewing cellarmen and the like is done without a lot of socializing. If I am socializing, it’s rarely for a blog post or column because I’ve found that most of those notes and even some memories get lost in the ether. For three days in July, however, I get to do both: kindle online acquaintances with real-life encounters, ask questions that no one in the civilian world would care about, and party with some talented writers. The other reason to go is the education. From Brandon Kraft of WordPress, I learned that there are no more tight and successful groups than the “mommy bloggers,” and that we could learn a thing or two from them. Of course, I learned a bit more about WordPress, including that I need to delve into the plug-in world of Jetpack. From Mark Yocum of Budweiser — who led what turned out to be an eye-opening demonstration of Bud’s daily quality-control tasting — I learned that relentless pursuit of consistency earns plenty of respect, even from hard-core microbrewery fanatics like beer bloggers. We also heard from beer distributors, and I learned that to ignore that tier in the beer-supply chain means missing a vital part of the overall story of beer. There was plenty of talk about how to get more eyeballs to your blog, but a lot less of that than the last conference I attended in 2013. This year there was more emphasis on quality. One of the best pieces of advice came from Sarah Benoit of the JB Media Institute. She talked about how blogs should follow a 30/30/30 rule: 30 percent of your content should be the “story of you,” as in what inspires and interests you personally; the next category is “the story of us,” as in what’s going on in the overall beer community; and the “story of now,” as in what can people do in the moment. (I’m not sure what the other 10 percent is for, but you can’t dictate everything.) Her presentation was generic, as she talks to people with different passions, but it applied to beer bloggers just fine. Here’s a link to Ms. Benoit’s presentation: RIGHT HERE. If you are a beer blogger and haven’t attended the conference, or if you are thinking of becoming a beer blogger, there’s no better time. Next July we’ll be in Tampa. Maybe I’ll see you there. This entry was posted in Beer Snob and tagged Beer Bloggers and Writers Conference, blogs, New Belgium Brewing, Oscar Blues Brewing, Sierra Nevada Brewing. Bookmark the permalink.